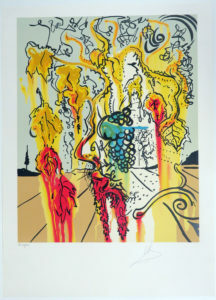 Salvador Dali Portrait of Autumn is an individual lithograph. Alternate titles are “The joys of Bacchus” and “Die Freuden des Bacchus.” Levine and Levine published the work. 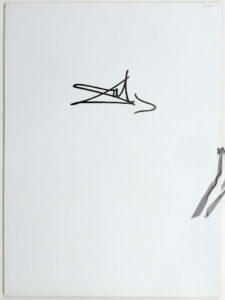 It has the blindstamp of DALART N.V. /Copyright 1980. The tirage is 1195. The lithograph comes with a white portfolio case and a page of text describing the thought behind the artwork. The case and text add a lot to the value of the art. Salvador Dali, in his revealing new lithograph “Portrait of Autumn”, uses the universal metaphors of journey and the seasons of nature to depict man’s passage through the states of life. In this classic image Dali has achieved a surrealistic fusion of time and space to show us his past, his present and his belief in the future. “Portrait of Autumn” is one of Salvador Dali’s most poignant and mature artistic statements. It is at once autobiographical as well as being a statement of his belief in the transcendence of man in this mortal world. In “Portrait of Autumn” the eye is immediately struck by a profusion of rich colors. Dali has coloured the stages of a human life as they are reflected in the seasons of nature. The bold reds are symbolic of vibrant youth in the halcyon days of sprint. The yellows are reminiscent of the mellow hues of a long fertile summer; those Promethean middle years of planting, cultivating and harvesting. The quiet burnished gold of the leaves and the Ampurdan plain suggest autumn and life replete with experience and insight. Finally, the pure white, stretching away to infinity and eternity is an indication of Dali’s belief that death is a state in life and that there is an existence after death.